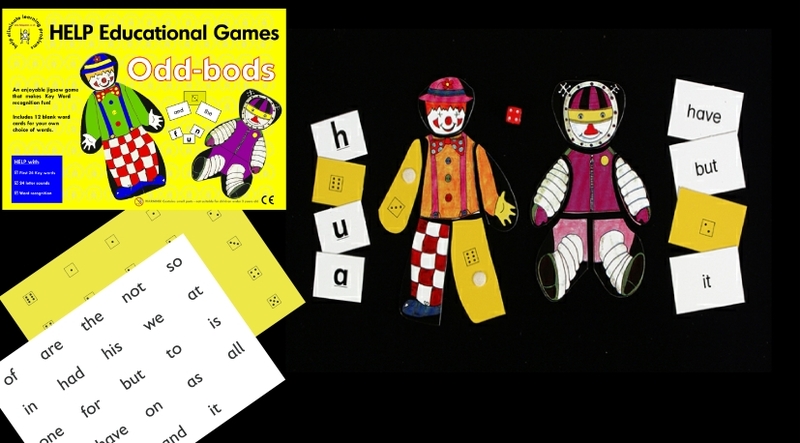 We have one game - ODD-BODS - which will help with letter sounds. Suitable for very early stages of learning, the game has 24 individual letter cards, which can be used in a variety of ways to help children become familiar with the letters of the alphabet and the sound associated with each letter. In addition, Odd-Bods has cards for the numbers 1 to 12. The letter cards feature lower case (or small) letters, as most books and games for young learners use lower case letters and children are taught these first at school. When using the game, remember not to teach the letters in alphabetical order and try to avoid teaching letters of a similar shape such as b, d or p, q at the same time as this can cause some confusion! There are 24 high frequency words and 24 letter sounds plus blank cards included for your own choice of words. Now also includes numbers 1 to 12 for number recognition. A game for 2 or 4 players. One of our best sellers!